Who doesn't admire Hot Rods? The fascination with Hot Rods started with the moonshiners during the Prohibition era. The government had outlawed the sale of liquor. But, the folks still wanted it. People living in remote areas began making their own liquor concoctions in hidden mountain stills and then sold it, at a premium, to bars across the country. Because of the huge risks involved, the liquor producers and runners needed fast cars to outrun the law. The result was the Hot Rod. Today, Hot Rod enthusiasts from all around the country trek to Pigeon Forge for the Grand Spring Rod Run to show off their custom classics and to admire the hundreds of Hot Rods on display for all to see. The 2016 Grand Spring Rod Run will be held in front of the LeConte Center in Pigeon Forge April 14-16. 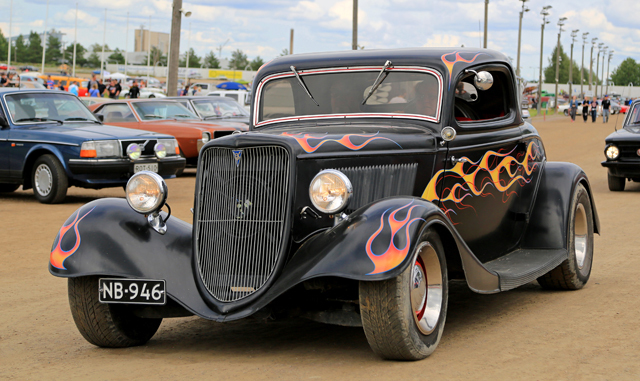 There will be a giant Swap Meet where you can pick up your own Hot Rod project or get ideas. Each evening, they will also cruise the Parkway like a parade through town. You don't need a Hot Rod to attend. You only need to come and admire them. The family-friendly festival type setting of the Grand Spring Rod Run can only ensure that everyone will have a great time. With the main event literally just down the street, book your stay at the Ramada Pigeon Forge North. You will probably get to rub elbows and share ideas with the owners of some of the most outstanding classic cars at the event. You can start your day off right with the complimentary breakfast buffet and end the day by relaxing in the indoor pool and hot tub area.